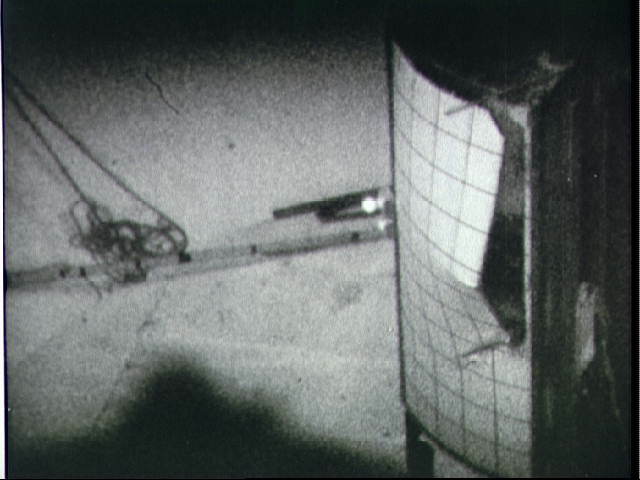 Sequence photo from 16mm motion picture film of test at Langley Research Center which seeks to determine mechanism by which Apollo 13 panel was separated from Service Module. The test used a 1/2 scale model with a honeycomb sandwich panel and was conducted in a vacuum (41982); Second photograph in sequence of three of panel separation test at Langley Research Center (41983); Full-scale propogation test at the NASA Manned Spacecraft Center of fire inside the Apollo Service Module oxygen tank. The photograph from a motion picture sequence taken from outside the vessel shows failure of tank conduit with abrupt loss of oxygen pressure (41984); Third photograph in sequence of three showing panel separation test at Langley Research Center (41985).